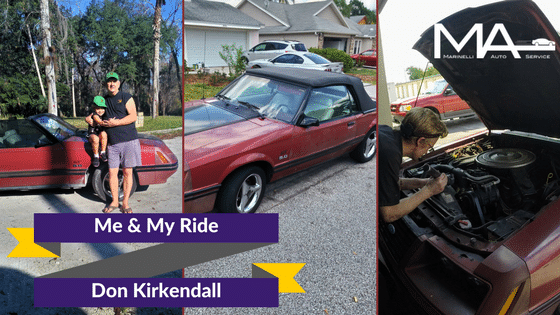 On a chilly morning in early January, I popped in on Don Kirkendall at his office at Kirkendall Insurance to ask him about his car. I have a unique relationship with Don because, not only does his company provide our Garage and Liability Insurance, but he’s also a customer. We’re glad he feels that way, because we won’t let anyone else handle our insurance! The truth is, Don cares about his car and we care about Don, and that’s why we also care about his car. 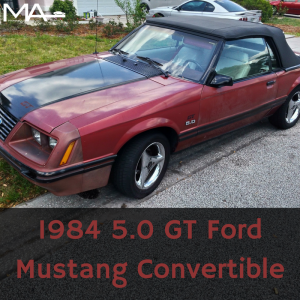 Why a 1984 Mustang Convertible? So Don waited, played around with a motorcycle for a while and it didn’t really tickle his fancy like the Mustang did, so he sold it and finally purchased a Mustang. “It’s not something I would want to drive every day, especially because of the horrible gas mileage it gets, but it’s fun. It’s a work in progress.” Every time he does a little bit of work on it, the more excited he gets about it. I also found out that the significance of it being manufactured in 1984 wasn’t really significant to him…until it was. “I wasn’t paying attention [to the year] at the time, because if I had to do it over again, I’d have an ‘87…well, ‘87 and up. All the parts are there, it’s just fantastically easier to get them for ‘87 and up. The other one I looked at was a ‘91 and so, really, I wasn’t paying that much attention to what year it was. I wanted a fox body, so that made that easy. For Don, cars aren’t just a get from one place to another. Yes, he has a newer reliable daily driver, but the weekends are for “putzing around” in one old automobile or another. When I asked how his wife felt about all these old cars he tells me, “She’s been through this before.” He owned a 1965 Triumph Spitfire, then got a 1959 Edsel Wagon, and then came the 1984 Ford Mustang Convertible. Owning these cars aren’t just about “putzing around,” though. He likes to take his grandchildren to car shows, and eventually plans to exhibit his Mustang once the renovations are complete. He enjoys having conversations about what he’s done on the vehicle and what he plans to do. But mostly, he enjoys the time it affords him with his family. I try to drive it every weekend. 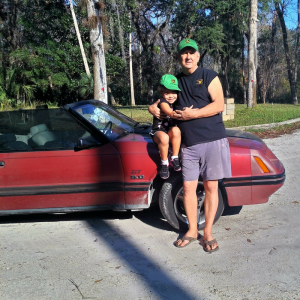 As much as Don enjoys the fun aspects of having an older vehicle, he also wants to be able to know that the people riding with him are safe and wants to be wise with his investment. He doesn’t claim to know everything there is to know about his car. 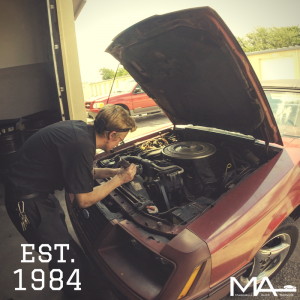 That’s when Don satisfied my curiosity – without my having to ask – why, if he’s so knowledgeable and so particular about his vehicles and who gets to work on them, he brings his beloved Mustang Convertible to us. You have to remember, he’s looking at everything…and it’s a good thing because you want to know those little things. We care about Don and Don cares about his car and the memories he wants to make in it with his family, so we do everything we can to give Don the most accurate information we can so he can make the most informed decisions he can. And so Don checks off boxes on the 3 page list that Andrew prepared for him as finances allow, starting with safety concerns, like the brakes, and so on down the list until he finally gets to a point when he’ll enter his dear Mustang Convertible in a car show. I think I’d like to go to that car show!